I have a secret to reveal today! What are 3 top ways to align business to customer evolution? More importantly, what are the benefits of doing so for business leaders, entrepreneurs and their customers? Even though I work with clients on how to align their businesses to customer evolution all the time, I had a close call to do this from my own audiences recently. A number of people have been asking about how I can share some of the business and personal growth ideas I write and speak about in a more condensed and one-stop-shop type of channel. In our modern times, when we serve different types of audiences with varying preferred methods of communication, this seemed a slightly tall order and challenging request (but very fair). So I did some thinking, and then, there was the aha moment! What happened to the book I’ve been meaning to write? At least, a book is a one-stop-shop right? Did I hear you say ‘wrong’? Well, there are different formats of a book; electronic, audio, hard-copy etc. The key is, the content will be the same and it will be in a single place. Readers will just choose their favourite mode of consumption. So, that’s how I’m aligning my business to a segment of my clients; for growth. Why is it Important to Align Business to Customer Evolution? For a reminder of why this is so important, please refer to the eBook ‘Evolution of the Buyer’. As the buyer and customer evolves, in addition to other external and internal factors affecting the business, business leaders need to evolve certain keys aspects and people within the business; to ensure it continues on a growth path. When customer evolution is not identified and addressed correctly, a number of businesses face huge disappointments in their growth numbers. This is due to not being aware of and able to address this modern business challenge or trend. This is not an exhaustive list, but certainly key indicators from observation and experience with a variety of businesses. In Ben Smith’s video above, he and his team ended up growing their mid-size business exponentially. 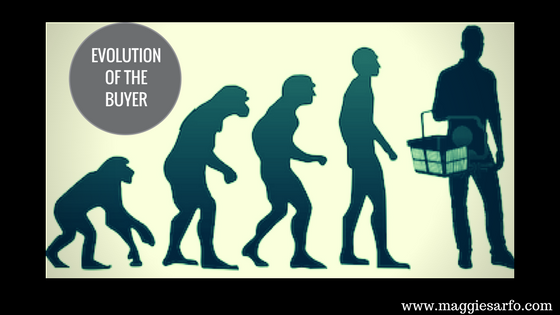 He attributed this to addressing customer (buyer) evolution. This shows the correlation of these 3 areas to customer evolution. In a nut shell, be inspired to take your business to the next level – incorporate customer (buyer) evolution alignment strategies in your growth plans. If you don’t have the internal expertise, you are not alone. Find an external expert to support you with this. It will be worth your while! Maggie Sarfo is a passionate author, speaker, advisor and mentor for ambitious business executives, entrepreneurs and professionals looking to explode growth revenue, create new markets or access their highest potential. Her blog is her playground, where she explores the topics of business growth, personal growth and peak performance. Learn more about her programmes.